The correct answer is all of the above. 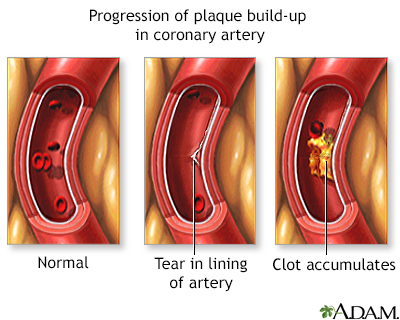 Heart disease can lead to a heart attack when plaque builds up in the arteries that supply blood to the heart. 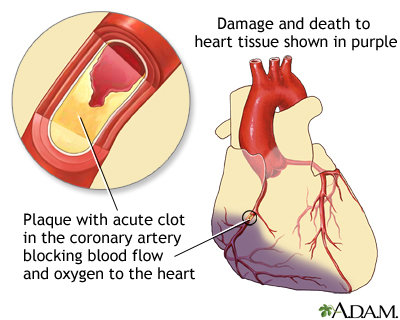 If a blood clot forms, it can block blood flow to the heart. This causes a heart attack. 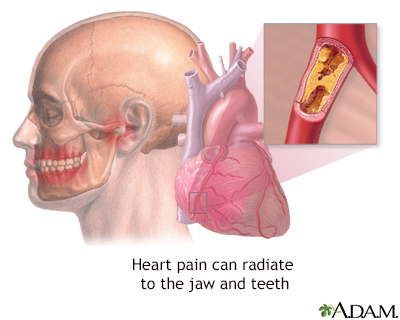 Less often, a heart attack occurs due to a spasm in an artery that supplies blood to the heart. What are risk factors for heart disease and heart attack that you can control? The correct answer is all of the above. Not smoking is the best thing you can do for your heart. You can also lower your risk by staying at a healthy weight, eating a low-fat diet, and getting regular exercise (talk to your doctor before starting to exercise). Taking your medicine for high blood pressure and diabetes also lowers your risk. What are the risk factors you can't control? The correct answer is all of the above. Men are more at risk for heart attacks than women, but a woman's risk increases after menopause. African-Americans, Mexican-Americans, American Indians, Hawaiians, and some Asian-Americans have a higher risk for heart problems. If your parents have heart disease, you are also at risk. Stress can add to your risk of heart disease. The correct answer is true. Some studies have found a link between stress and heart disease. How you deal with stress can also have an effect. If you overeat, drink alcohol to excess, or smoke in response to stress, your risk goes up. Drinking red wine is a good way to lower my risk for heart disease. The correct answer is false. While some studies show that alcohol may have small heart benefits, it also increases the risk of alcoholism, high blood pressure, obesity, and breast cancer. So if you don't drink, don't start. If you do drink, limit it to no more than one drink a day for women and two drinks a day for men. You can't miss signs of a heart attack. The correct answer is false. Not everyone has the classic sign of a heart attack: sudden, intense chest pain. 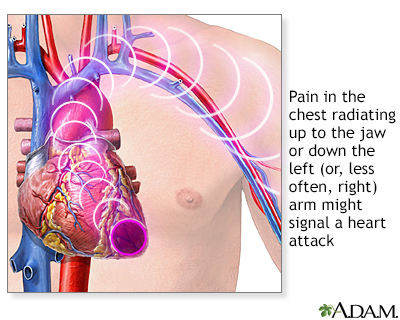 Chest pain may be mild or feel more like pressure or fullness. Not everyone has the same symptoms, so you should know all the signs of a heart attack. The correct answer is all of the above. While chest pain or discomfort is the most common symptom, symptoms can be less obvious, and you may not know what's going on. The more symptoms you have, the more likely you are having a heart attack. Women have different heart attack symptoms than men. The correct answer is false. Men and women can have all the same warning signs. However, women are more likely to have shortness of breath, back or jaw pain, nausea, or feel light-headed. These symptoms may occur without chest pressure or pain. The correct answer is call 9-1-1 right away. Minutes count during a heart attack. The sooner you get help, the less damage to your heart. Aspirin can be harmful for some people, so don't take it unless told to do so by emergency or medical personnel. You can prevent a heart attack. The correct answer is true. The American Heart Association recommends the ABCs for heart attack prevention: Avoid tobacco. Become more active. Choose good nutrition. You will be hooked up to a heart monitor, so the health care team can see how regularly your heart is beating. You will receive oxygen so that your heart doesn't have to work as hard. An intravenous line (IV) will be placed into one of your veins. Medicines and fluids pass through this IV. You may get nitroglycerin and morphine to help reduce chest pain. You may receive aspirin, unless it would not be safe for you. In that case, you will be given another medicine that prevents blood clots. Dangerous abnormal heartbeats (arrhythmias) may be treated with medicine or electric shocks. Angioplasty is often the first choice of treatment. It should be done within 90 minutes after you get to the hospital, and usually no later than 12 hours after a heart attack. 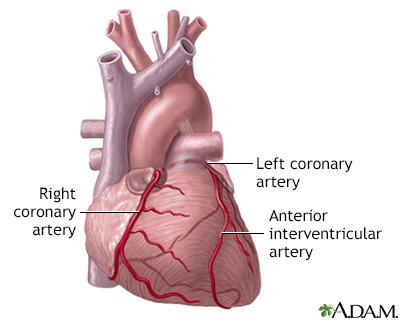 A stent is a small, metal mesh tube that opens up (expands) inside a coronary artery. A stent is usually placed after or during angioplasty. It helps prevent the artery from closing up again. You may be given drugs to break up the clot. This is called thrombolytic therapy. It is best if these drugs are given soon after the onset of symptoms, usually no later than 12 hours after it and ideally within 30 minutes of arriving to the hospital. 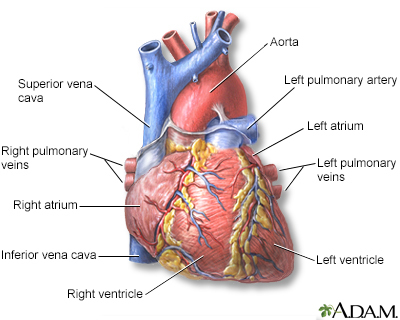 Some people may also have heart bypass surgery to open narrowed or blocked blood vessels that supply blood to the heart. 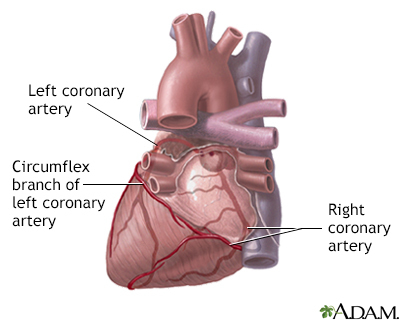 This procedure is also called coronary artery bypass grafting and/or open heart surgery. After several days, you will be discharged from the hospital. You will likely need to take medicines, some for the rest of your life. Always talk to your provider before stopping or changing how you take any medicines. Stopping certain medicines can be deadly. Strong emotions are common after a heart attack. All of these feelings are normal. They go away for most people after 2 or 3 weeks. You may also feel tired when you leave the hospital to go home. Most people who have had a heart attack take part in a cardiac rehabilitation program. Many people benefit from taking part in support groups for people with heart disease. After a heart attack, you have a higher chance of having another heart attack. 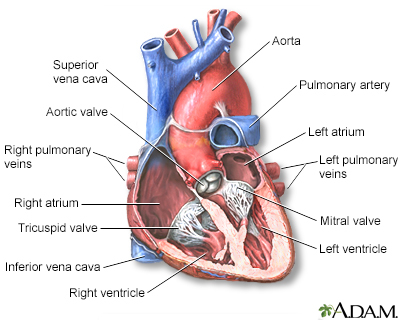 If your heart can no longer pump blood out to your body as well as it used to, you may develop heart failure. Abnormal heart rhythms can occur, and they can be life threatening. Most people can slowly go back to normal activities after a heart attack. This includes sexual activity. Talk to your provider about how much activity is good for you. Various phases can be seen through ECG wave tracings following a heart attack. Hyperacute phase begins immediately after a heart attack. Fully evolved phase starts a few hours to days after a heart attack. Resolution phase appears a few weeks after a heart attack. 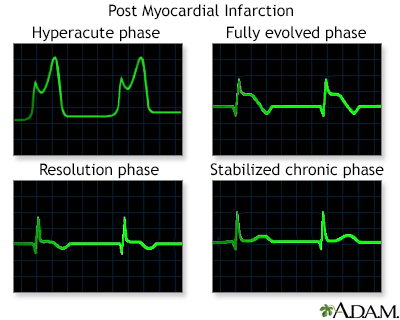 Stabilized chronic phase is the last phase and typically has permanent pathological changes compared to a normal ECG tracing.